The Acura Advantage Leasing Program is making luxury more accessible than ever! Drivers who don’t want to compromise on their next, new car will be pleased to know that a new Acura could be yours for just a fraction of the sticker price. We here at Gateway Area Acura Dealers want to help you get the driving experience you’ve always wanted. Come see us at one of our dealerships in Baton Rouge, Metairie, or Shreveport to start customizing your lease today. Flexible Terms: Your lease can run from 24 to 60 months, and you can even cut out your monthly payment with a one-payment lease option. Choose Your Mileage Limits: Leases have mileage limits, but Acura gives you options from 10-15,000 miles per year, and if you need more, you can add more miles on at signing. GAP Insurance: GAP insurance, also known as Guaranteed Asset Protection, makes up for any difference between your insurance coverage and the remaining amount owed on your lease if your vehicle is stolen or totaled. Guaranteed Purchase Price: When you lease your Acura, the purchase price at the end of your lease is fixed to help protect you from any market fluctuations. Choose Your End-of-Term: At the end of your lease, you can return the vehicle to us, purchase it outright for the agreed upon amount, or purchase or lease a new Acura vehicle. Do you have questions about the Acura Luxury Lease? Let us know. 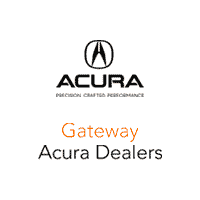 Contact or visit a Gateway Area Acura Dealers near you to learn more. **A loyal client is one who purchases or leases another new Acura or Honda automobile within 30 days prior to or after the turn-in date. Total amount waived not to exceed $1,500.